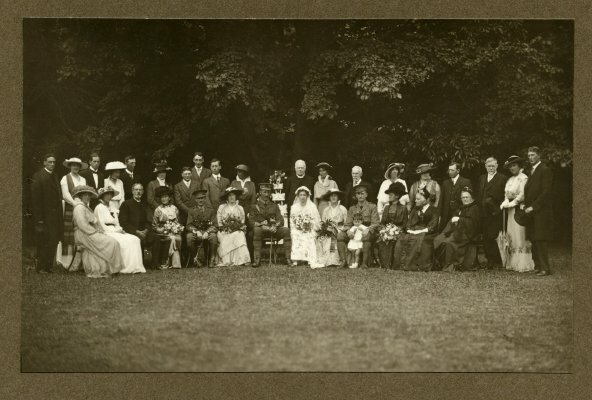 Description Wedding photograph for Aumuri Beryl Grace and William Norris Masefield married 18 December 1915. Bishop Suter (centre back) and Aumuri's father, Archdeacon Thomas Grace, (3rd front left) and Mrs. Grace (4th left) are also present. Lieutenant Bill Masefield, of Manaroa, Clova Bay, Pelorus Sound, embarked for Egypt and the front in February 1916. In 1914 he was New Zealand Rifle Champion and he still held that title when he went overseas with the New Zealand Rifle Brigade. He fought at the Somme, France, where he was wounded in the shoulder and in October 1916 he was promoted to Captain for 'especially good service in the field'. His younger brother, Robert Taylor (known as Ben) Masefield, at home on the family farm at Manaroa with his widowed Mother, was called up in May 1917 and was fare-welled in Market Place as part of the 29th Reinforcements. His draft brought the number of men contributed by Marlborough to 1443 and in accordance with custom each man was presented with a book of tickets in the Marlborough Art Union. Captain Bill Masefield was welcomed home in January 1918, after being wounded again in 1917 and invalided home. He had married Aumuri Beryl Grace, the daughter of Archdeacon Grace, in 1915 before going to war and after the deaths of her father in April 1918 and Bill's brother, killed in action in October the same year, they, with their two sons and Bill's Mother, moved to Ellerton, a farm in Kekerangu. After the war Bill returned to competitive rifle shooting, his injured arm and shoulder causing him trouble for a number of years. Sadly Beryl died in 1925, but Bill married again in 1929 and it was that year that he was back in winning form, eventually being admitted to the National Rifle Association New Zealand Hall of Fame with notable performances in 1914, 1929, 1936, 1939 and 1948. In World War 2 he was Company Commander of the Nelson-Marlborough Mounted Rifles Regiment with the rank of Major, and in peace time was a tireless worker for the various Marlborough Rabbit Boards. He died in 1963 and is buried with his second wife at Kekerangu.